The first two stories were generated mostly by Twitter threats, a sewer of such vicious evil. They might not result in violence, but such leftist threats on Twitter are definitely becoming more common. And interestingly, even as Twitter is shutting down conservative speech it seems to have little problem with death threats against conservatives. The third story however is more worrisome. It is part of a pattern where the insane over-the-top statements by Democratic Party elected officials is fueling a hatred among those who are less than stable themselves, resulting in acts of violence. Nor is this the only story recently where an unstable person attacked something or someone because they were perceived as conservative. And the craziness on the left shows no signs of letting up, as indicated by the decision of leftist Las Vegas professor to shoot himself in the arm “in protest of President Donald Trump.” Though I have no evidence to support this theory, it appears to me from the story that he might have planned on suicide, but chickened out. I am very worried that in the next two months we will see at least one attack against Republicans similar to the attempted mass murder last year of Republican congressmen at a charity baseball practice. In fact, I fear that such violence is almost certain. This detailed analysis of the police radio traffic during the Las Vegas shooting dispels many of the absurd rumors about what happened, based on actual data. I spent some time today listening to the audio feed of the police radio traffic for about 90 minutes following the start of the active killer event on Sunday night. If you are interested in active killer response, either from the police or armed citizen perspective, this audio is pure gold. In general, the police had a stellar response. Being able to hear how it played out is an incredible resource for anyone studying the topic. This article is primarily written for my police readers, but has some very important insights for my armed citizen readers as well. The post includes the full audio if you wish to hear it yourself. One tidbit that news reports are not covering: “It appears that the shooter had stopped firing by the time the officers isolated him to his room. Most likely, patrol officers would have forced entry into the room if the killer had been firing on their arrival.” This is only about eleven minutes after the first 911 call. It is about time: More than 130 Muslim religious leaders in the United Kingdom are refusing to perform funeral rites for the terrorists who attacked people this past Saturday on London Bridge. The decision by the Muslim leaders was seen as an “unprecedented” move because the funeral ritual is typically performed on a deceased Muslim no matter the person’s past actions. The group of religious leaders have urged others to join them in declining to pray for the dead killers. So, does this mean they had no problems with performing rites for the terrorists of earlier attacks, such as at Westminster earlier this year and the July 7 attacks several years ago? Meh. I must say that though this is the right response on their part, I am not very impressed. For more that two decades the Islamic community in the west has sat on its hands, making believe they have nothing to do with Islamic terrorism, or quietly supporting it by non-action. They are suddenly realizing now that people are losing patience with them, and that their safe havens in the west are now increasingly threatened. Most politicians might still be mouthing platitudes of “We have to all get along,” but the public is increasingly angry and demanding action, even if it means kicking every Islamic practitioner back to the Middle East. Thus, though I do not like attacking people with such broad strokes, I can understand why it is happening. And the Muslim community has no one to blame but themselves. Guess who: On Sunday seventeen India soldiers were killed by terrorists thought to come from a Islamic terror group based in Pakistan. The Director General of Military Operations, Lieutenant General Ranbir Singh, said the terrorists were foreigners and there are clear signs of the role of the terror group Jaish-e-Mohammed, whose chief Masood Azhar is based in Pakistan. The group had been involved in the attack on Pathankot air base in January during which 7 army-men were killed. An analysis of the situation can be read here. The FBI today arrested in a shoot-out an Afghanistan-born suspect in the bombings this weekend in both Manhattan and New Jersey. A bar owner in Linden, New Jersey called police around 11am Monday morning, after finding 28-year-old Ahmad Khan Rahami sleeping in the entryway of his business. When police arrived on the scene, Rahami brandished a weapon and started shooting at the cops – injuring two. Officers eventually shot Rahami in the right shoulder and he was taken from the scene in an ambulance, handcuffed to a stretcher. Police released Rahami’s picture Monday morning, saying he was wanted for questioning in connection to the Saturday bombings in New York City and Seaside Park, New Jersey, as well as the foiled bombing of the Elizabeth, New Jersey train station on Sunday. Law enforcement say it was fingerprints left behind on an unexploded pressure cooker bomb in Manhattan that led them to Rahami. Twenty-nine people were injured when another bomb placed a few blocks away was detonated Saturday night. Now that Rahami is in custody, investigators are now looking into whether he acted alone or was perhaps working with or for a larger terror network. There are several facts about this weekend’s bombings, which can also be applied to this weekend’s knife attacks by an Islamic radical in Minnesota, that are instructive. First, everyone’s first and immediate assumption, including myself, was that they were planned and carried out by Islamic terrorists. I didn’t publish anything to say so, because I do not like to speculate. I do admit, however, to the same human biases as everyone else. Second, that assumption turned out to a reasonable assumption, since it, not surprisingly, turned out to be correct. Three, even before the suspect was identified, ISIS and Islamic supporters worldwide were celebrating the bombings and boldly announcing that more such attacks will be forthcoming. The point here is that we need to recognize that we are at war. The Islamic world wishes to conquer and destroy the western world, and if we do not begin to realize this soon, we will find ourselves soon conquered by them. And if you think I am over-reacting, watch this video at this link.Or this video here. I am sure they will be those quislings who will argue that it is our fault this situation exists, but the bottom line remains: Do we wish to live as in a society that believes in freedom, science, justice, and equal rights, or do we wish to be conquered by a medieval power-centered ideology that oppresses its population while giving as much power as possible to its rulers? The religion of peace strikes again: Thirty-four are dead and almost 200 injured in suicide attacks in Belgium today. ISIS has claimed credit for the attacks. I think the reactions of our politicians here is of some significance, as by contrasting them we can learn a bit about each. Obama inserted a short pro-forma statement of sympathy during his prepared remarks at the start of a press conference in Cuba, then appeared to forget about the entire horrific attack. Donald Trump called for greater border security and a renewed consideration of the use of waterboarding to obtain information from captured terrorists. Hillary Clinton (at the previous link) expressed some incoherent blather about following “our values”. Ted Cruz possibly spoke with the most clarity. Cruz also criticized Trump’s proposal yesterday that we pull back from NATO. I leave it to you to decide who appears to have the greatest grasp of the situation. And if you think I am spinning this to favor Cruz, go to the links and get a closer look at the other reactions. Note for example that, other than a twitter comment, I could not even find a story that specifically discussed Hillary Clinton’s reaction. Update: I have added the cartoon showing Mohammad with a bomb in his turban because I think the response to these thugs has to be to defy them as blatantly as possible. I need to remember to do this more often. As usual, yesterday’s mass shooting in California caused President Obama and the entire left to go into spasms demanding more gun control. A gunman shows up at a random site and begins shooting innocent unarmed people, and the first instinct of the left is to disarm more people so that vicious murderers will have more unarmed people to nonchalantly murder. I say, it doesn’t matter whether yesterday’s killers were Islamic madmen, right-wing madmen, left-wing madmen, or plain-old madmen. What matters is that they had an easy time killing lots of people, because those people decided to remain unarmed and helpless in the face of violence. I say, arm yourself. Get prepared so that if you find yourself in such terrible circumstances you can fight back and possibly survive, and in the process maybe save a lot of other lives as well. The likelihood that there will more such killers, most of whom will likely be Islamic terrorists because that is whom we are presently at war with, is quite high. To sit helpless and not prepared for battle is the height of foolishness. You are personally responsible. You cannot depend on the police or government to defend you. You need to be prepared to defend yourself. Arm yourself. The next time a killer shows up there should be ten free Americans capable of stopping him or her in their tracks, before anyone innocent dies. Surprise, surprise: The Iran nuclear deal has allowed Iran to immediately send more cash to the terrorist organizations Hamas and Hezbollah. Since the deal was signed, Iran has significantly increased its financial support for two of the largest terror groups in the region that have become political players, Hamas and Hezbollah. In the years before the deal was signed, the crippling sanctions limited this support, which had significantly diminished along with Iran’s economy. But Tehran’s belief that tens, or hundreds, of billions of dollars will flow into the country in the coming years as a result of sanctions relief has led to a decision to boost the cash flow to these terror organizations. This support, for example, has enabled Hezbollah to obtain highly developed new armaments, including advanced technologies that many militaries around the world would envy. Al-Rai, a Kuwaiti newspaper, reported Saturday that Hezbollah has received all the advanced weaponry that Syria has obtained from the Russians. The report cited a security source involved in the fighting in Zabadani, on the Syria-Lebanon border, where Hezbollah is fighting the al-Nusra Front, the Islamic State, and other groups. It is evidently the growing Iranian financial support that is enabling the Lebanese Shiite militia to purchase advanced weapons, including ones that were hitherto outside of its reach. There is more. Read it all. As Ted Cruz had correctly noted, Obama’s Iran deal would make his administration the world’s biggest financial supporter of terrorism. This article proves that statement 100% correct. Peace in our time: Even as a jihadist attacked military recruiting offices in Tennessee this week, there was also a major terrorist attack in France, with all evidence pointing at Islamic terrorists as the attackers. The attack, three separate explosions at a petrochemical plant, has interestingly not been reported in detail by a single mainstream news source in the U.S. I wonder why. Could it be that these events put the lie to President Obama’s Iran deal, that agreeing to this deal will only make our lives more dangerous and will empower the radical and violent Islamic movement, which is as virulent in Iran as it is in the Islamic State? Nah. It’s all in my imagination. President Obama couldn’t be wrong. He wouldn’t lie to us. This morning civilized people the world over were greeted with several stories of hate and violence, where the perpetrators attempted to kill large numbers of people, merely because of their race or religion. The first — and the one that our bankrupt mainstream media will spend all of its time reporting — occurred in Charleston, where a hate-filled racist killed nine black church-goers during a prayer session. This was an evil act, committed by an evil and sick man. No sane or civilized person on the left or right condones it. Two other stories, both reported in the Israeli news outlet The Jewish Press, described two attacks in the Middle East, one on a Jewish religious site and the other on a Christian religious site. Both of these Middle Eastern attacks are as evil as the massacre in Charleston. Both expressed the same mass hatred of a group of people, this time based on religion rather than race. And as in Charleston, no sane or civilized person on the left or right should condone them. Sadly, I expect America’s modern leftwing intellectual class, represented by our mainstream media, to focus entirely on the first, not only condemning the murderous attack in Charleston but to use that act as an excuse to attack all conservatives, essentially repeating the crime by expressing a mass hatred of an entire group of people, this time because of their political beliefs. The Middle East violence will meanwhile be ignored. In fact, if you dig hard enough, you will likely be able to find examples in the left wing press where these acts are condoned. In a sense, the reactions of people to these violent evil events provide us a litmus test for hate. They will reveal who is civilized and who is not. Those who are civilized will condemn them all, and will not spend any time trying to assign the act to their political opponents. Those who are not will try to make political points and will try to assign blame in all the wrong places. Watch and listen. If you pay close attention over the next few days, and keep a clear mind, you will be able to learn a lot. Whose side is Obama on? Though ISIS has specifically put Pamela Geller on its kill list, her calls to the FBI have gone unanswered. This story reminds me of the fake FBI investigation into the IRS scandal. Obama was outraged by the scandal and said he would hunt down the wrong-doers with every ounce of his being, but the FBI never assigned anyone to lead the investigation, and none of the conservatives who were harassed by the IRS were ever interviewed by any FBI agents. Here, an American is threatened with death by an Islamic terrorist state, and the FBI, and the Obama administration, does nothing. As I said, whose side is Obama on? It gets better. Read it all. Why I pay very little attention to demonstrations: A wide shot of the big name politicians at Sunday’s Paris demonstration against Islamic terrorism shows that none of them were really at the demonstration. Instead, the politicians were gathered together on a separate street, guarded by security, so that they could link arms just for a photo op. The march itself was elsewhere. I also suspect that they all just gathered very quickly to take the picture than scattered their own separate ways immediately afterwards. This is why I don’t really care that Obama nor anyone important in his administration showed up. Maybe they should have, and in fact maybe it is another sign of Obama’s incompetence that he did not make sure there was an important U.S. presence there, but who really cares? This is just for show. What would really mean something to me is if these political leaders actually used this meeting to organize some concrete action to deal with Islamic terrorism. Did they? I think not. As far as I can tell they have made no plans to do anything about it, other than maybe increase security in their own nations, which is merely another way of restricting the freedoms of their own citizens. Hardly what I would call fighting back against tyranny, terrorism, and oppression. The religion of peace marches on: French Muslim students refuse to stand in honor of those killed by the recent terrorist attacks. They also attacked those Muslims who did stand. The religion of peace marches on! Thousands dead in another Boko Haram massacre in Nigeria. District head Baba Abba Hassan said most victims are children, women and elderly people who could not run fast enough when insurgents drove into Baga, firing rocket-propelled grenades and assault rifles on town residents. “The human carnage perpetrated by Boko Haram terrorists in Baga was enormous,” Muhammad Abba Gava, a spokesman for poorly armed civilians in a defence group that fights Boko Haram, told the Associated Press. He said the civilian fighters gave up on trying to count all the bodies. “No one could attend to the corpses and even the seriously injured ones who may have died by now,” Gava said. The key word above is “another”. Killings like this are not a bug in Islam, they are a feature. Fascists: A California newspaper has been vandalized because of its insistence on describing illegal immigrants as “illegal immigrants”. The Santa Barbara News-Press’s front entrance was sprayed with the message “The border is illegal, not the people who cross it” in red paint, sometime either Wednesday night or early Thursday, according to the newspaper’s director of operations, Donald Katich. The attack came amid wider objections to a News-Press headline that used the word “illegals” alongside a story on California granting driver’s licenses to people in the country illegally. So will someone explain to me how these pro-immigration vandals are any different from the Islamic terrorists who murdered the cartoonists at the French magazine Charlie Hebdo? In truth, they are only different in their scale of violence. The pro-immigration vandals have not yet risen to the level of the Islamic terrorists, but give them time, give them time. Anyone who thinks violence and destruction is acceptable to prove their point will eventually decide that murder is acceptable as well. The cartoon on the right prompted the first Islamic riots. More recent ones in the French magazine Charlie Hebdo apparently prompted today’s violent murders. The goal of these Islamic acts of violence: To stop people from criticizing Islam. My goal in publishing this cartoon: To defy these thugs and to encourage people to criticize Islam. In the past two decades we have seen nothing but violence, terrorism, death, and destruction from this Arabic religion, fed by hatred and bigotry of Jews and Christians. It is time to say so, bluntly. If Muslims wish this criticism to stop, they need to do something about it themselves, as the President of Egypt has, instead of demanding others to shut up. The religion of peace strikes again: Twelve people were murdered today by Islamic terrorists at a French satirical magazine. The magazine, Charlie Hebdo, had published many cartoons making fun of religion. Fortunately, they were able to avoid the hoards of Jewish and Christian terrorists that tried to kill them. In addition, a car bomb has exploded in front of a synagogue in the suburbs of Paris. Update: An accident unrelated to terrorism. The Obama administration has been quick to act, condemning the attacks while once again insisting that Islam is “a peaceful religion.” That is a quote, today, by Obama’s own press secretary. Make sure you read James Delingpole’s prediction of what will happen next as our leaders will do anything to avoid facing reality so they can continue to live in a fantasy world where Islam is our friend and it is the evil racism of the west that caused this tragedy. 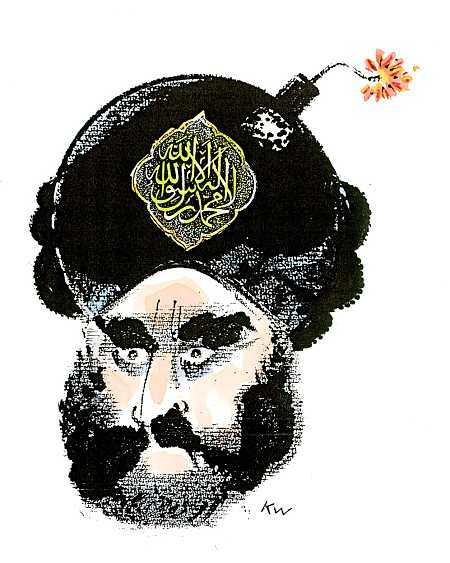 In defiance of Islam’s effort to impose its will on us all, here is a link to some of the cartoons Charlie Hebdo previously published making fun of Islam. Click on it. Spread it around. Let’s have everyone see it! Pigs fly? Speaking at a religious conference on January 1, Egyptian President Abdel Fattah al-Sisi called for a major reassessment by Islam’s religious leaders. That thinking—I am not saying “religion” but “thinking”—that corpus of texts and ideas that we have sacralized over the years, to the point that departing from them has become almost impossible, is antagonizing the entire world. It’s antagonizing the entire world! Is it possible that 1.6 billion people [Muslims] should want to kill the rest of the world’s inhabitants—that is 7 billion—so that they themselves may live? Impossible! I am saying these words here at Al Azhar, before this assembly of scholars and ulema—Allah Almighty be witness to your truth on Judgment Day concerning that which I’m talking about now. All this that I am telling you, you cannot feel it if you remain trapped within this mindset. You need to step outside of yourselves to be able to observe it and reflect on it it from a more enlightened perspective. Sisi was bluntly telling the religious leaders of Islam that their radical and violent interpretation of Islam is making the religion an object of hate and contempt and disgust by everyone else in the world, and they had better rethink that interpretation before it destroys the religion. If only more Islamic leaders were willing to make this kind of demand. Does this make you feel safer? A Delta employee was arrested today for smuggling guns on several commercial flights. Henry allegedly brought the firearms in his carry-on luggage on at least five flights from Atlanta to New York between May 1 and December 10. During that time frame, Henry supplied a total of 129 handguns and two assault rifles to co-conspirators in New York, the affidavit states. One of those co-conspirators ended up selling the firearms to an undercover New York police officer. Henry was arrested in New York on December 10 after landing at JFK airport with 18 handguns in his bag — seven of which were loaded, the affidavit says. He apparently used his security clearance to bypass the TSA, thus avoiding getting sexually abused while also bringing loads of weapons on board numerous flights. But the TSA works! The government tells us so!